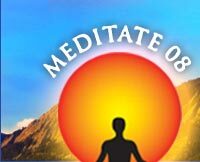 Meditate 08 is made possible by folks who believe that Meditation makes a difference. We need your support to help pay for sound equipment, tents, chairs, transportation, insurance, signs, brochures, posters and volunteer support. EarthNest Institute is a Colorado 501 (c) (3), non-profit organization. All donations are fully tax deductible. Donations in any amount are most appreciated. Checks work best and will be accepted through September 2008.